The quest for the high score to the Donkey Kong arcade machine was made famous by the documentary, The King of Kong, A Fistful of Quarters. 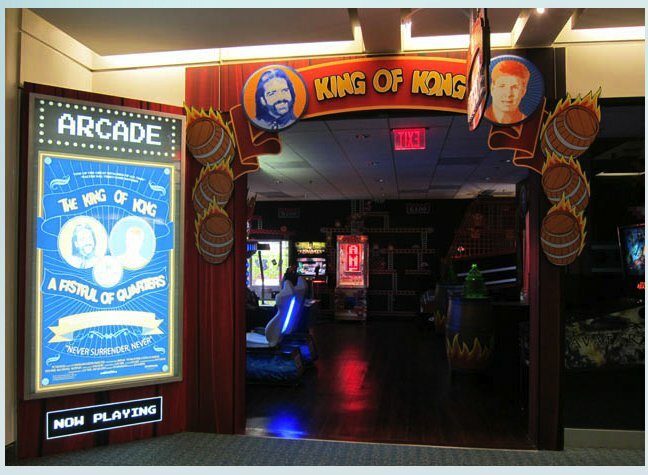 Thanks to that film, the rivalry between Billy Mitchell and Steve Wiebe is now something of legend and also thanks to that film, there is now an arcade named King Of Kong Arcade, at the Orlando, FL airport. which just happens to be owned by Billy Mitchell himself.the picture above comes from Walter Day’s Facebook page and below is a video on Youtube providing a brief walk around the place. The most surprising thing about this is that there is no Donkey Kong machine to be found, despite the overall DK theme. Some people are agitated by the lack of any classics but for a small arcade they have some nice newer games – a pair of Dead Heat machines, Terminator Salvation standard, a pair of Super Bikes 1 machines, an Avatar pinball, an Aliens Extermination, a Winners Cube and an air hockey table. I can understand some frustration at the lack of classic titles but then again those don’t exactly bring in the big bucks to pay your expenses either, and I’m speaking from experience on that. Still, having a Donkey Kong machine on hand would capitalize on the overall theme and it would probably do ok, or having a classics compilation like Arcade Legends 3 or Pac-Man’s Arcade Party. Next time I’m at this airport for IAAPA, I will have to check it out. What no Pac-Man or Donkey Kong in Billy Mitchell’s arcade! You HAVE to have donkey kong in that arcade! Ugh, that’s just awful. I’d be pissed of if I was Steve Weibe. When Orlando International Airport first moved into the building they are in now I worked in the video game room they had back then. I think it was 1981. We had over 90 video games and 4 or 5 pinball machines. Steve Wozniak happen to come in one day. He walked past every video game and went straight to the pinball machines. I absolutely love Billy Mitchell, he is a legend! I really want to go there now. I realize this article is a bit old, but I find it humorous Billy wouldn’t even play Steve in the movie, but now has an entire business about the competition he never had.